The Discovery Science Center in Santa Ana, California is celebrating their 15th year hosting the BubbleFest; a three-week long exhibition of hands on bubble science, as well as a Bubble Show featuring Fan Yang and son Deni Yang, showcasing their passion and skill for bubble making. Fan has been practicing and working with bubbles for 27 years. He has crafted an unique art form, creating unimaginable bubble shapes from a soap solution. On April 4th, 2011 at the Discovery Science Center in Santa Ana Families lined up and signed up to take part in the record attempt. In a very organized fashion, people were led on to a stage where they were strategically placed. Fan, Deni and Melody Yang worked together to simultaneously pull up pulleys, drawing the bubble wand up and around the people. 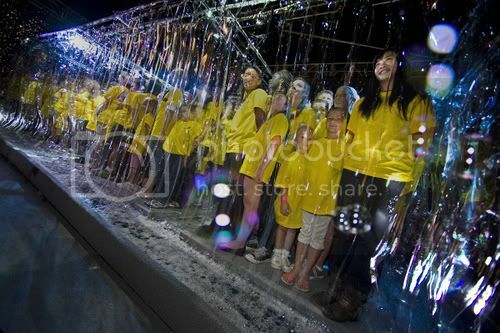 As part of the Guinness World Records guidelines, the participants inside the bubble had to be at least 5 feet tall. 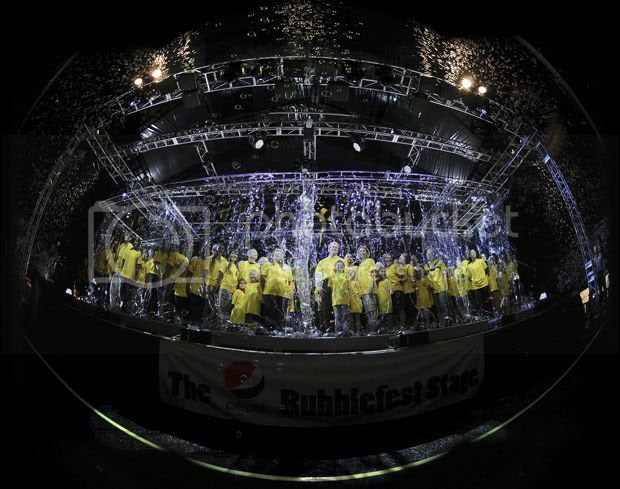 A total of 151 people were inside the bubble, but only 118 people officially qualified as over the height requirement; setting the new record at 118 people inside a soap bubble.